In many ways, running is a perfect sport: You don’t need a team or any equipment, or even a field. You get time to think or zone out. Just grab your running shoes and head out, however fast or far your feet may take you. 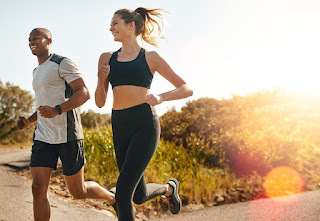 As simple as it sounds, there are some definite running don’ts in terms of how to keep your body healthy and in good condition. Whether you’re new to the sport or have been running for years, you want to be sure you avoid these common running mistakes. However ready your body may feel for that run, not warming up can do some serious damage. Most of us are sedentary for a large portion of the day, so getting our bodies moving should be gradual. Even if you’re on the move throughout the day, take a few minutes to start your workout with a light jog to loosen up your muscles. If you’re at the point in your running routine that you plan out your runs by intensity, be sure to include easy days – and follow through on them. Your body needs lighter workouts to recover and restore itself between the tougher ones, so giving every run your all isn’t doing you any favors. On that note, taking rest days is also important. Sometimes it’s okay to just chill on the sofa. Your arms aren’t involved in running, right? So why are we even mentioning them? Your whole body works together with each step you take, and your arms help in the process. You want to keep your arms light while allowing them to swing naturally as you stride. The momentum of each swing can help propel your body forward – especially up those hills. One of the most common causes of injury is wearing the wrong pair of shoes. Perhaps your shoes pinch your right big toe just a bit. Or you want to bring to life that old pair from five years ago. Resist the urge. The lifetime of a shoe is anywhere from 300 to 500 miles, depending on the surface you run on and how much material your shoe has to support your foot. Running on dirt roads or trails means your shoes will last for longer than pounding on asphalt with each step. Regardless of where you run, you’ll want to keep track of roughly how far you’ve run – and invest in a new pair of quality running shoes regularly for running injury prevention. At some point in your running career – even if you get new shoes regularly – it’s likely you’ll be faced with an injury. Whether it’s a sore hip or shin splints, your body is trying to tell you something, so be sure to listen. Don’t push through the pain; instead, take the time your body needs to heal. This may require you to completely stop running for a while. This can be difficult, but pushing through may cause further damage and put you on the sidelines indefinitely. While avoiding these running mistakes will make your jogs more enjoyable, you’re still bound to face some hiccups along the way. Be patient with yourself, and don’t forget to breathe! We’d love to hear your running tips in the comments below!